The #478 Thigh Wrap helps reduce muscle sprains and pulls. 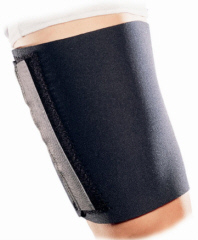 Compresses and supports soft tissue while retaining therapeutic heat. Thermal neoprene wrap with nylon facing on both sides. Fully adjustable Velcro® closure and universal sizing assures optimum fit. Retains warmth and promotes healing.